The Cardiac Arrhythmia Society of South Africa’s annual symposium will be held in Johannesburg on 23 February and in Cape Town on 2 March. 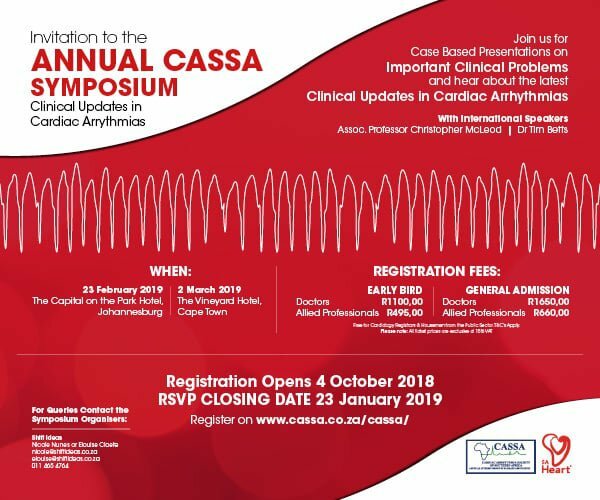 The annual CASSA Symposium is an event targeted to physicians, cardiologists, electrophysiologists and allied professionals throughout the subcontinent dedicated to the study of management of cardiac arrhythmia. The conference’s mission is to improve the care of patients by promoting research, education and training by providing leadership towards optimal healthcare policies and standards. CASSA brings out two international speakers every year and hand pick some of the best local doctors and professors to speak alongside them. This year’s symposium will feature international speakers Associate Professor Christopher McLeod and Dr Tim Betts.